With the amazing season finale finally in the bucket, and having given you time to watch it, I’d like to go over how Marvel’s Agents of S.H.I.E.L.D. finally gained traction and an audience. Agents had an amazing pilot then kind of drizzled out. Then they started getting some big hitters and hinting at some good storylines. I want to get one thing straight. This group of S.H.I.E.L.D. agents really is a GREAT cast. I love everything about them and I especially love how the character’s backgrounds really come together to give it life that is lacked in team dynamics on other shows. But there was a short period of time this season, where I started to get upset about the way the show was going. THANKFULLY the show finally found its groove. The addition of Bill Paxton really gave the show the punch it needed in order to gain some viewers. Even though he was only in a third of the episodes, you have to admit that those were your favorite episodes of the season. Like the episode “Turn, Turn, Turn”. That episode pretty much laid the ground work for how Agents Of S.H.I.E.L.D. became the show to watch on Tuesday nights. With all the twists and turns (eh? EEEH?) we finally got a spy thriller going again! And with all of the S.H.I.E.L.D. goodness going on, we almost forgot about Skye being a mystery all in herself. We just started loving her character. I really enjoyed how she opened up from being a loner to becoming the epitome of a team player. That just goes to show you how great of an actress Chloe Bennet is and how a good writing team can create a strong female role. But the big story here is how Clark Gregg’s Agent Phil Coulson finally became that guy we wanted him to be during the season finale, “The Beginning of the End.” Sure he was awesome throughout the season with his quippy one-liners and his nice-guy attitude (remember, he told Audrey “The Cellist” Daniels how she would always be safe in the episode “The Only Light in the Darkness”). 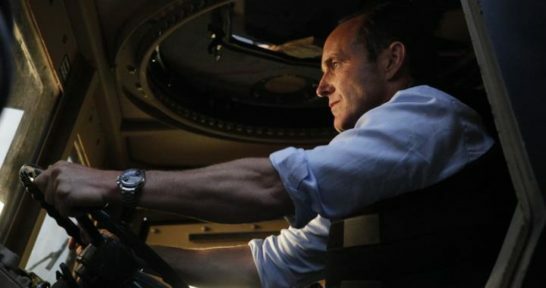 By the end of the season, Coulson became resolved. That’s something that carried over throughout the entire season and paid off in the best of ways. Sure it took a cameo appearance from Samuel L. Jackson (Nick Fury) to pull it off, but I’m not going to complain. I can’t get enough Nick Fury cameos as it is! Plus, now that we have a resolved and in-charge Director Coulson at the helm, we can look forward to even more secrets of the Marvel Universe being revealed in season 2. Let’s not forget that Avengers 2: Age of Ultron as well as many other Marvel properties will be filming soon. With the addition of more grounded heroes like Luke Cage, Iron Fist, Jessica Jones and Daredevil, the possibilities are pretty much endless and they are BOUND to come together at one point or another. But more to the point of Agents Of S.H.I.E.L.D. season two, we can look forward to more answers for questions laid out in the first season. Like those of Skye’s parents, the alien language that Phil is writing on the wall and the fate of Fitz. I’m so glad I stuck it out with this show. It is easily laying the groundwork for future Marvel properties which means it can only get better from here on out. Thanks for listing the page! I am loving the site!